Eat, Drink, Dance, Run, Play, Read, Write, Cook, Shop, Chill. Love your community and your planet and celebrate every discovery. Live every moment like it's 90 seconds long, and made of crushed red velvet. This is my blog. Thanks for stopping in. Lately, in my new endeavor as a travel agent, I get that familiar (and frustrating) question, "Why would I need to book with a travel agent?" 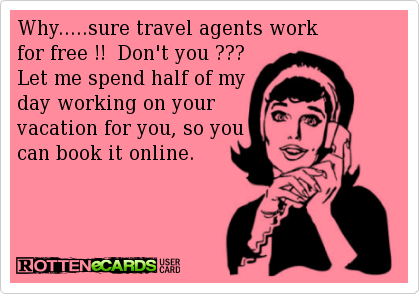 I'm hoping after reading this, your question will be, "Why HAVEN'T I worked with a travel agent?" I think it will be. Here's my attempt to clear up any confusion regarding the benefits of working with a travel agent. To think that you save through those online agents is a HUGE misconception and can make all the difference in what your vacation experience looks like. Best price to value guarantee- BECAUSE the online booking agencies like Expedia and Cheap Caribbean are taking a cut out of traditional travel suppliers, many of the suppliers now OWN those sites, (Mark Travel and Apple own Cheap Caribbean, for example) meaning we can price match pretty much everything. And, what you get in added value by going through an agent versus a global website for the same price makes all the difference in your trip. 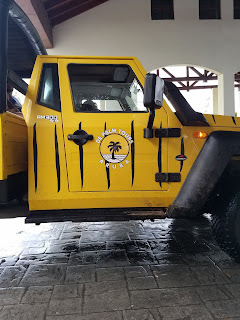 For example, veteran suppliers usually include nice perks like free transfers with their on island Destination Management companies, meaning you save more $ and the hassle of figuring out how to get to your resort. Also, there's a recognizable representative on site at the resort to help you with everything from excursions to issues. Not the case with Cheapotravel.com. Have an issue? You're on your own. 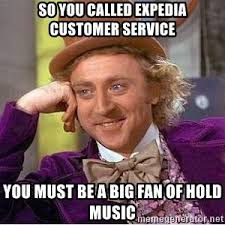 And, with the exception of custom services like daily tour itineraries or flights only searches, working with a travel agent is FREE, because the resorts and tour operators pay the agent. We work on straight commission so knowing our stuff, retaining our clients and managing our time is crucial to staying in business. That's also a big part of WHY continuous learning and fostering industry relationships are a must for an agent. 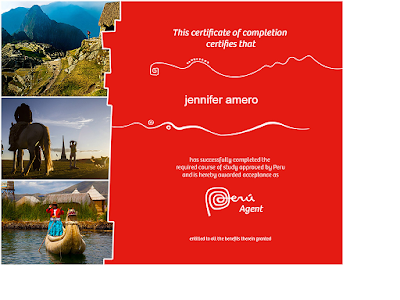 Property and destination expertise - we are always taking live and online courses, webinars, certifications and site visits from the tourism board, tour operators and properties to be able to sell these vacations. 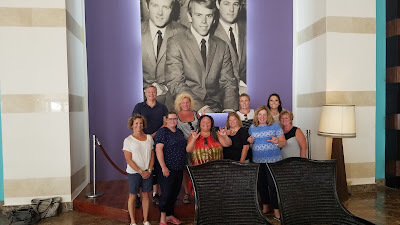 We KNOW the faces at the resorts because we visit so when we send you, and call the management, we aren't just a name, we are a familiar face. 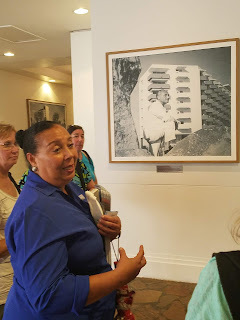 First hand knowledge - we VISIT properties, ships and tours annually to know what's new (and what needs a little refresh), where the best beaches are and which look better in photos than real life and what tour operators make your excursion exceed expectations. It goes a long way in ensuring the beach in the brochure is actually the beach your are dreaming of or that your discount "garden view room" isn't overlooking a parking lot. 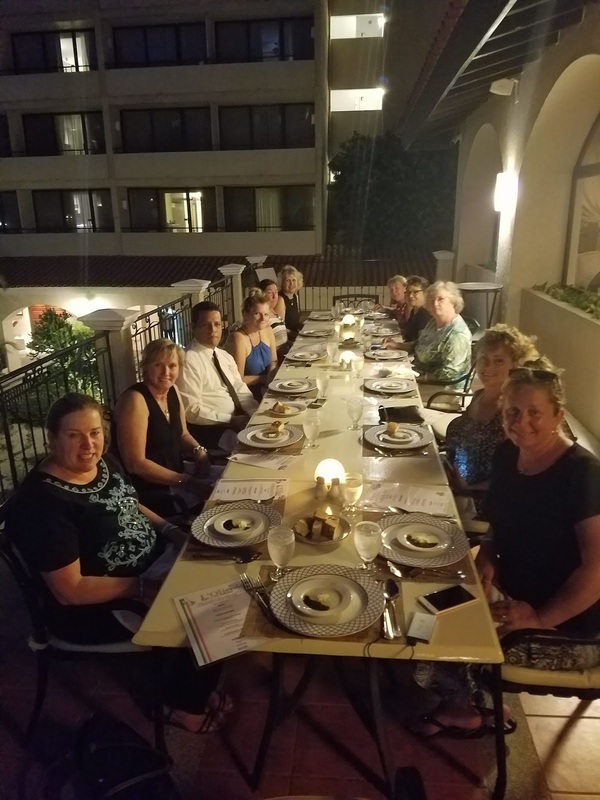 Industry connections - from onsite tour operators at your resort to direct lines to resort management, we have connections that make your vacation seamless. 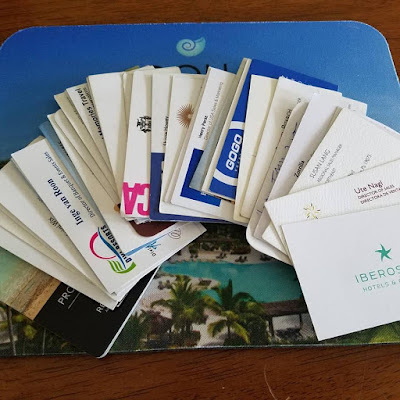 Also, having a direct connection AT a resort may spare you getting entangled in a timeshare pitch from someone you thought was connected to your trip. Tools - from building your custom itinerary for independent travel in Europe to programs that arrange car service to those off the beaten path locations to engines that help us to compare and price match your online deal, getting you the greatest value, the most seamless experience and the best price is what we do all day every day. Professional advice and support - we engage in agent forums so if we don't know a thing or two, we know a TON of experienced agents who can help us find the answer. Advice - from getting the best deal, to choosing the best trip for everyone in your group to when you should go to get the best weather and the least crowds to how to get the best coverage on trip insurance, to handy apps to use abroad, we can help. Remember: Our service is free, your memories are priceless. Email me to get on your way! Check out my travel website! Be sure to mention this blog. The best way to learn about a thing, I am certain, is to do that thing. And, I am still new to the travel game. I mean, not as a traveler, though I have a bucket list longer than a CVS receipt (New Englanders will understand). As an agent, I've got a lot to learn. As a voracious learner, I've been doing just that. From completing some 30+ online and live certifications on destinations and resort groups, tour products to group travel to attending trade shows to spending months under the tutelage of my mentor and other, seasoned industry pros, I haven't wasted a minute of this long multi month "internship" in travel. The pinnacle of my recent learning experience has been in attending FAM trips. Short for "Familiarity," FAM trips offer agents the opportunity to be on location in a destination for a few days, visiting hotels, touring the location's natural, cultural and historical points of interest and spending face time with a whole host of invaluable connections that help US to select, book and execute the perfect vacation experience for each individual client's needs. My FAM to Aruba, one of two islands I visited in early fall, left me clear of two things. ONE: Aruba has a whole lot more to offer than just casino hotels and time shares. TWO: If I'm going to be good at this travel agent thing, I need to go EVERYWHERE so that I know what I don't know. My preconceived notion and my actual experience with Aruba are a great example of just this. Aruba, in my mind, was a place for time share owners who travel to the same place on the same weeks with the same people every year. The more adventurous, cultural immersion kinda traveler in me rejects this type of travel. I don't gamble, I don't like high rise hotels, I don't like going to the same place more than once and I don't like the idea of flying far away and then running into hordes of home town homies just when I am trying to escape the home town for awhile. This is why I had never BEEN to Aruba. I was wrong. Really wrong in many ways. Sure, the high rise section does have a LOT of casinos. And, there are a TON of timeshares and the island IS about the easiest place to vacation, without a car, no matter how old or young you are. And because of it's proximity to Columbia, well below the Caribbean hurricane belt, the weather is almost always near perfect and the trade winds are a blissful thing on a hot sunny day. 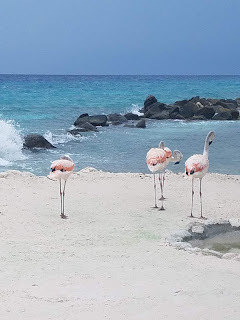 But the other things about Aruba, the other places I visited in Aruba, the other excursions I experienced in Aruba are unique to Aruba and make the island a very special place. The high rise section is popular for it's abundance of shops,big hotels and casinos. But it also has funky beach bars, over water restaurants and toes in the sand establishments where you can enjoy everything from fruity drinks to elegant multi-course dinners by live saxophone. 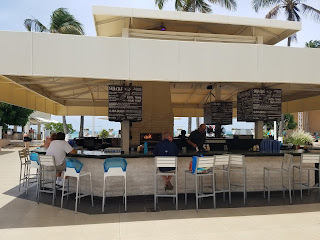 The daytime revelry is reminiscent of Orient Bay on Saint Martin but the nightlife continues long past when other day drinking beaches have rolled up their sandy sidewalks. As for favorite accommodations in the high rise section, the history buff in me swooned over the Hilton's recent renovations. The first hotel on the island and pioneers of tourism in Aruba, Hilton's re-brand has the resort filled in the most comprehensive and holistic way with artifacts and images documenting the history of Aruba as one of the world's most popular sunny escapes. 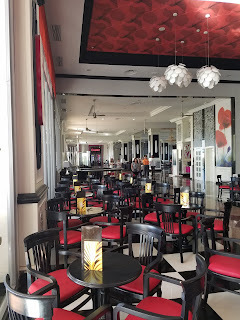 The RIU Palace would be a close runner up if I were in search of a VERY lively pool, Hollywood glam decor (which I love) and the ease of an all-inclusive food and beverage plan. The low rise section is quieter but certainly not boring. In fact, as a guest, it's probably where I would opt to stay. I like to rest in the quiet and visit the lively. Divi Village offers great multi level suites for families, Divi Aruba Phoenix Beach is perfect for groups and Tarmarijn, my favorite for it's open air pizza oven, innovative self-service hibachi-style tables in Palm Grill and reciprocal access to the Divi Aruba all on a glorious beach would suit my family just fine. Plus, there's a shuttle to the high rise section on the cheap - like $3 on off all day. 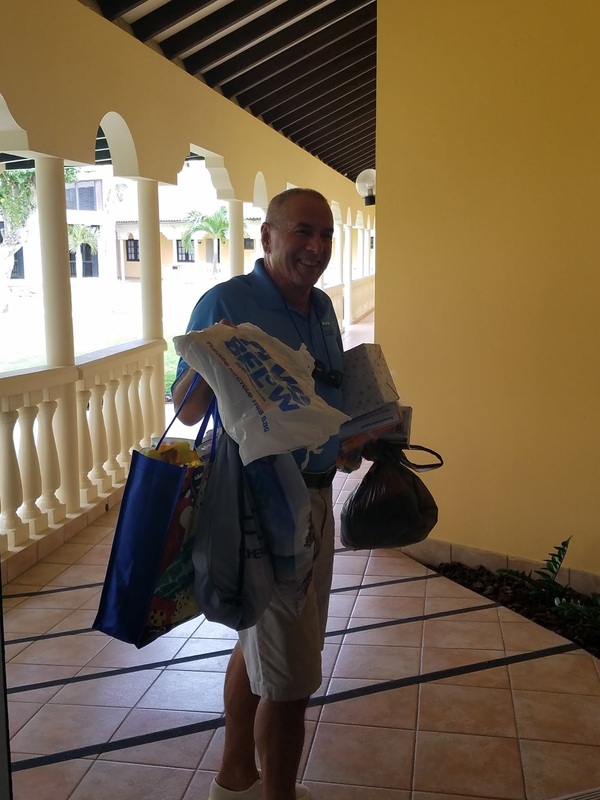 In fact, fun family options for a life outside the All Inclusive are plentiful in Aruba, and a very sweet property in the low rise section would be my dream for a multi-generational group willing to do their own meal prep, as my crew often will. 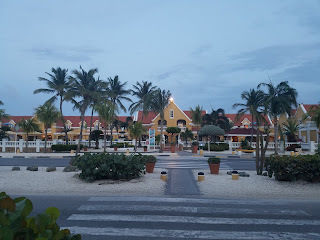 Amsterdam Manor, a lovely village of colorful cottages just 34 size 9 women's steps across a floral lined crosswalk to breathtaking Eagle Beach has a very fairy tale feel and a price point, especially on Aruba, that is pure magic. Sunset dinner at their Passions on the beach was particularly memorable as the parent of a vegetarian, the menu was inventive and very veg-friendly. Given the luxury of a few days of true R&R with the hubs, Manchebo and neighboring Bucuti & Tara would be the choice. Both focused on wellness and serenity, they are not locations for the swim up bar crowd. Our site visit at Manchebo began with an hour long yoga class in a beachfront open air gazebo blessed by Aruba's famous tradewinds. Hello Savasanah. The spa is Polynesian. The experience had me choosing Muesli over bacon at breakfast. Bucuti, next door, is, without question, my most favorite special place on Aruba for a myriad of reasons. Peaceful, elegant, organically beautiful, the resort is a delight for the eyes. Environmentally responsible in a way that has helped stimulate green island initiatives, staying at Bucuti means investing in the island, the environment and the planet. Owner, Edwald Biemans, a gracious, charming and very down to earth gentleman who formerly managed Manchebo, has built social responsibility into the Bucuti story from inception. Meeting us at the door to collect items for "packing with a purpose", a nonprofit that encourages visitors to pack toileteries and school items, clothing and other essentials into their luggage for donation to a local orphanage, Edwald posed for a group photo, then whisked away the armfuls of bags, without calling on staff to help carry or even open a door. 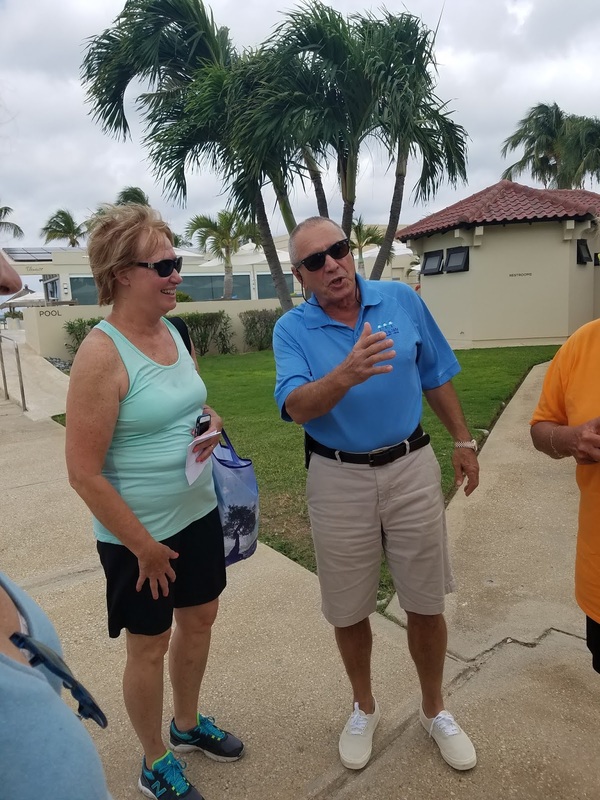 He was beaming about the good work of serving as liaison between visitors to his island and the people who live and work there. Edwald's conscious design is everywhere at Bucuti. From the stainless steel beverage containers guest receive at check in (and filtered water stations throughout the grounds) to the hotel's location far above the tide line to mitigate wear on the foundation to the limited smoking section (only one on the grounds), to the experimental spin bike in the fitness center that generates electricity while a guest works out, when you are at Bucuti you know you are leaving no trace. So it should come as no surprise the resort has just been awarded recognition for being carbon neutral. Bravo, Ed and team. And, for a totally unique experience, Renaissance in the capital city of Oranjestad is a special resort. The decor has a very "Alice in Wonderland" fell (I LOVED) but the real treat is the property's private island, accessible by boat and teeming with tropical animals, like flamigos, iguanas, wild birds and fish. 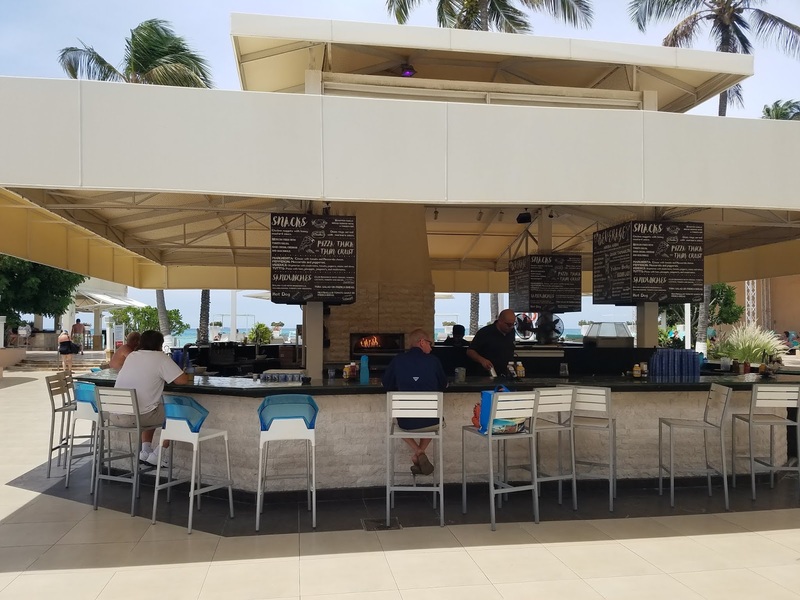 On island bar and grills and equipment rental make for a perfect day and the resorts' location in the marina make for a fun night. 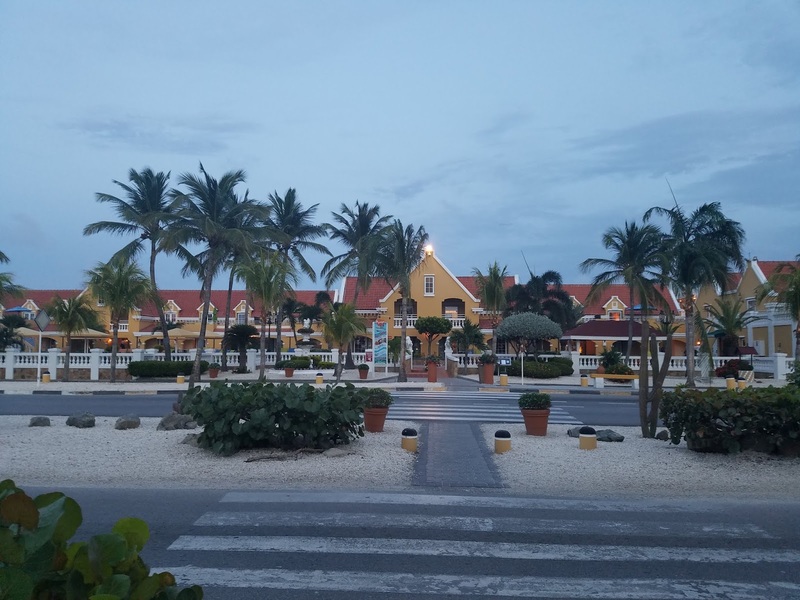 The resorts are abundant, well maintained, offer options for every traveler. The people are SO FRIENDLY. The island is safe (1% crime rate) and the things to do seem endless. But, Aruba is so much more. It's foodie heaven. Home to hundreds of restaurants with chefs from around the world, Aruba is the "Culinary Capital of the Caribbean, which, along with it's pedestrian friendly design explains why there are so few All Inclusives on the island. It's actually a disservice to self to stick to resort food with so much to taste so very nearby. Unexpected activities on the island round out the food and hospitality aspects of a stay on Aruba. Our group sailed on the Catamaran X, picked up directly on the beach in front of our hotel afforded us both gorgeous snorkeling and the chance to swim down to the wreck of the Antilla, to hear her history and understand Aruba's part in navel history. We also took a WILD ride in an open air jeep so jacked up with an extra 40k in hydraulics to traverse the totally undeveloped southern side of the island (like Cabo, but bumpy and with NO ROADS) to visit the natural pools, the natural bridge, the x caves and 10000 breathtaking and hair raising vistas nearly untouched by construction. I admit it. Aruba surprised me. I never entered a casino. I never bought a tchotchke. I never sat at a swim up bar. I DID take a yoga class. I DID swim in a natural pool. I DID go offroading through the desert. I DID chase fish into a sunken ship and I DID experience what brings 86% of guests back to the island year after year. 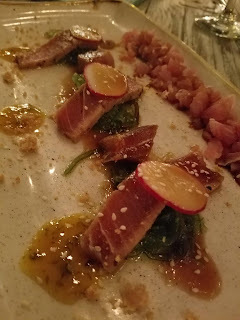 What’s for Dinner #426 (April 2019) - Spring - So good, easy, and healthy!